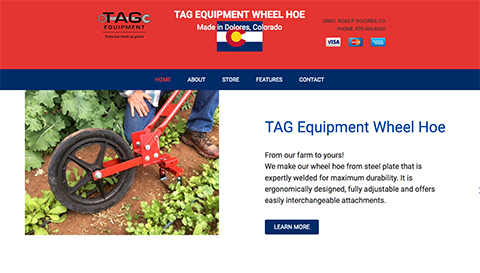 Local machinist and farmer Tom Gentry of Eagle Tree Farm needed a simple eCommerce website to showcase and sell his invention – the TAG Equipment Wheel Hoe. The eCommerce website features a fully functional web store and a professional responsive theme designed using the client’s branding to highlight the different features of this unique product made in Dolores, CO. The TAG Equipment Wheel Hoe web store utilizes a simple interface for a seamless checkout experience and has some built-in features for easy social media integration.